Three dresses with pockets, January 1917. Butterick patterns from Delineator. I intended to write a nice, short blog post showing color images of clothing from January 1917, but I started to notice the many variations on pockets in women’s clothing from that year. Pockets were a center of interest in 1917, and quite varied. Women’s pockets, January 1917. Unusual shapes, in a range of sizes. Delineator. Pockets were often quite low on the hip. The one at bottom right is trimmed with several rows of topstitching, very popular in 1917. The construction of the plaid double flap pocket at top right is unusual. At the end of a few hours browsing through Delineator magazines from 1917, I had a picture file much too large to put in one post. A deep pocket that is also a belt carrier. August, 1917. Delineator. Several interesting pockets from 1917. Delineator. A pocket so big that it has to be buttoned to prevent gaping. Delineator, March 1917. Behind it, a pocket gathered into ruffles at the top. Self-fabric belts with attached pockets, 1917. Delineator. 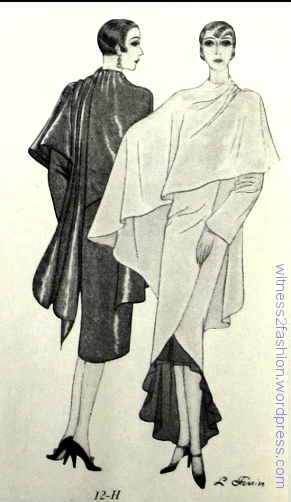 Small pockets suspended from the waist, Feb. 1917, Delineator. Hanging pockets trimmed with white soutache braid. Delineator, June 1917. Left, a peculiar, gathered, hanging pocket on a girl’s dress; right, wide pockets trimmed with buttons. January 1917, Delineator. Were these belts with pockets attached to the skirts? It’s not always easy to tell; they were apparently so common that the editors didn’t feel obliged to mention them in pattern descriptions. Delineator, Oct. 1917. “Bellows pockets” on clothes for teens, March 1917. The editors said you could get your daughter to compromise on other fashion details, but she would insist on bellows pockets. Delineator. Hanging bellows pockets on an adult woman’s suit, Delineator, March 1917, p. 63. Pockets that end in points, and stand away from the body. 1917. Delineator. More pointy pockets, 1917. Pockets were often enhanced with embroidery. I suspect that almost anything you put in this kind of pocket would fall out when you sat down. These hanging pockets look like the drawstring purses of the period, but they are attached to the waist or belt of the skirt. 1917, Delineator. A shallow, rounded pocket on Butterick 9931, for women or for teens. 1917. Right, Butterick 8989, a coat or jacket with gathered pockets. 1917. Pockets in Paris, Fall 1917. 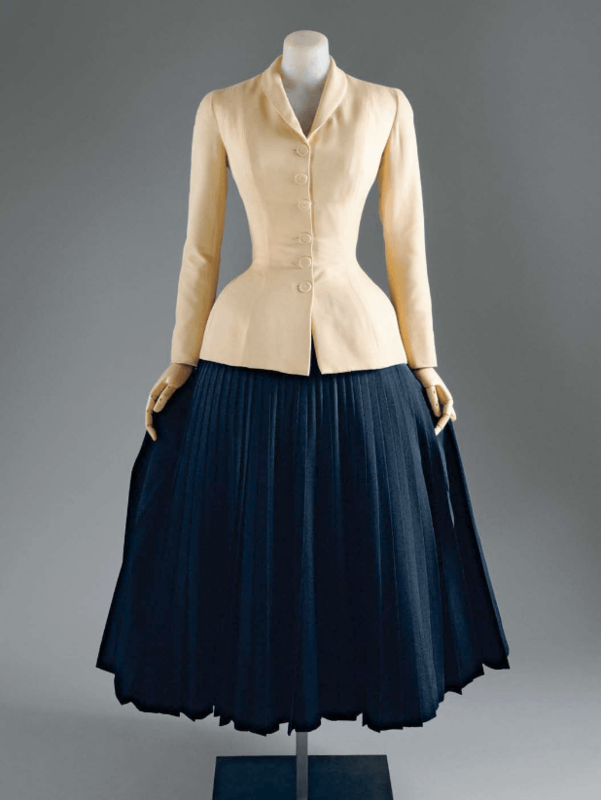 A suit designed by Chanel, and a dress with unusual pockets by Martial et Armand. Sketched in Delineator, they inspired Butterick patterns. Pockets on Paris fashions from Fall of 1917, by Poiret and Doucet. Sketched in Delineator. Embroidery on pockets was often seen, and that odd “turned up across the jacket hem” pocket was influential. A girl’s walking top, Butterick 9047, April 1917. These pockets literally couldn’t get any lower on the jacket. These blouses end in a sort of gutter; buttoned or stitched into place they would have acted as a pocket. Butterick patterns from Delineator magazine. A skirt with a buttoned turn-up cuff… 1917. Are those pockets for ammo? 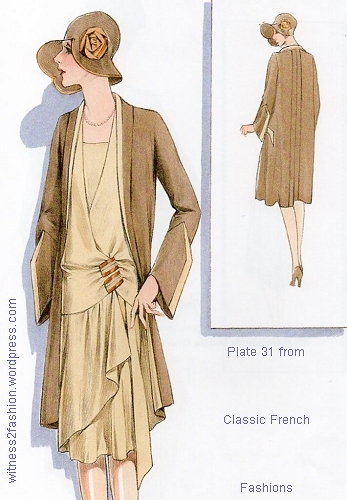 The skirt is described as having “French gathers.” Butterick skirt pattern 9140, Delineator, May 1917. Skirts with 1917 pocket variations. The skirts at far left and upper right are typical, but the skirt in the center, with button tab (pockets?) is weird. 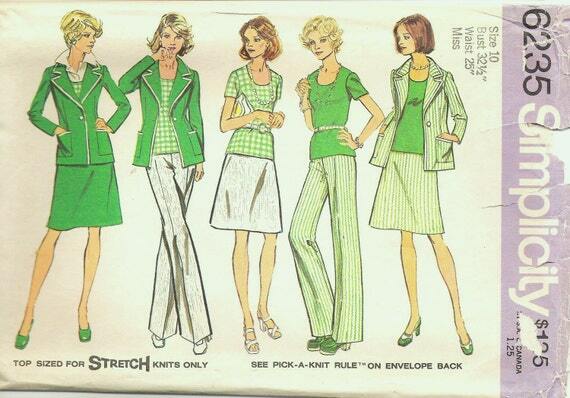 Butterick patterns. To modern eyes, the essential oddity of many 1917 fashions is that they were intended to make a woman’s hips look wider. Pockets were used to exaggerate the width of women’s hips, in French designer fashions (left) and in home sewing patterns (right.) Both illustrations from Delineator, 1917. Back views of three Butterick patterns, Sept. 1917. Delineator, p. 50. The two on the left really exaggerate hip width..
1917 pockets often curved around the hip to the back of the body. Many 1917 pockets wrap around the body, and stand away from it, increasing the apparent size of the hips. Delineator. Modern pockets tend to stop at or before the side seam, but in 1917, many pockets wrapped around the hip — from side front to somewhere on the back. In these back views of Butterick patterns, you can see that the gaping pocket continues around the side, extending the width of the body at the hip. Delineator, Oct. 1917. In the 1850’s and the 1950’s, full skirts and exaggerated hips made corseted female waists look smaller by comparison. But in 1917, there was no emphasis on a small waist. Dresses for misses 14 to 19. Butterick patterns, July 1917. Delineator. These pockets start toward the side in front and wrap around to the back of the dresses. There were pockets so strange that only the model’s pose confirmed that they were pockets. 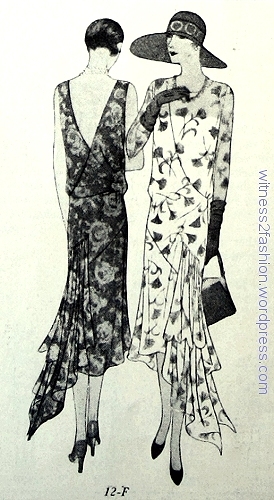 Two Butterick patterns from 1917. Left, No. 9376. Right, No. 9274. There are side openings on the “tonneau” (barrel) dress at right, but can we call them “pockets”? And, especially prevalent were pockets that drew attention to women’s hips. An embroidered pocket wraps around the sides of this gold coat. Delineator cover, October 1917. There’s no doubt that pockets add bulk, especially if you put things in them. But sometimes you just need a place to stash a hankie, a key, or a few coins. 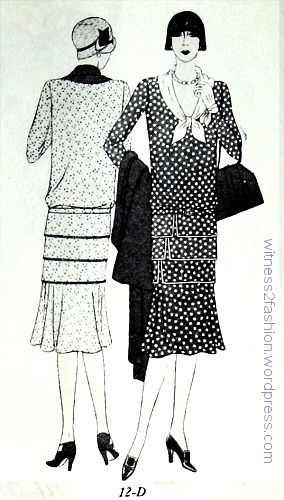 Dresses, skirts and blouses, Butterick patterns in Delineator magazine, July 1918, page 52. And here is a Delineator sketch of an influential Chanel suit from January 1925 — very a different silhouette. I’ll show the July 1918 images in greater detail below, but first, a few words about underwear and the “ideal” figure. Ideal fashion figures in July 1918 were thick in the waist, droopy in the bust — even with the model’s shoulders thrust back — and slightly swaybacked. Corsets for Fall, 1918. Sears catalog. 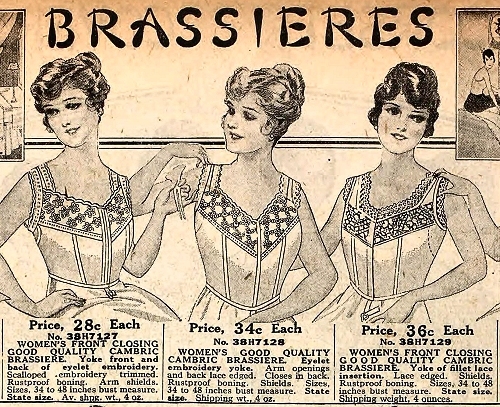 The brassiere of the World War I era was more likely to smash the breasts than to lift them. The corset of the “teens” did not reach (or support) the breasts at all. It extended down over the thighs and pushed the body very flat in front, causing a posture which made the waist higher in the back and lower in the front, as you can see from these 1917 skirt illustrations. Women’s skirts, Perry Dame catalog, 1917. The waistlines dip low in front and rise high in back. 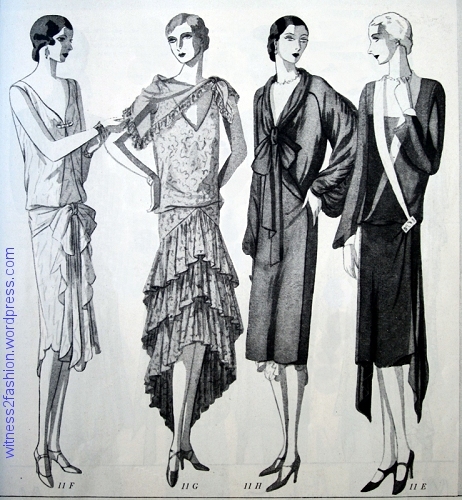 Skirts, blouses and dresses, from July 1918 show the oddly high waist in back. The beautiful vintage blouses of this period (sometimes called “Armistice blouses”) are often so short in back that they have to have a tail of fabric added before they can be worn without the corset. Otherwise, they won’t stay tucked in. This vintage “Armistice blouse” is shorter in back than in front, even allowing for its position on the hanger. It has not been altered; the ties are original. 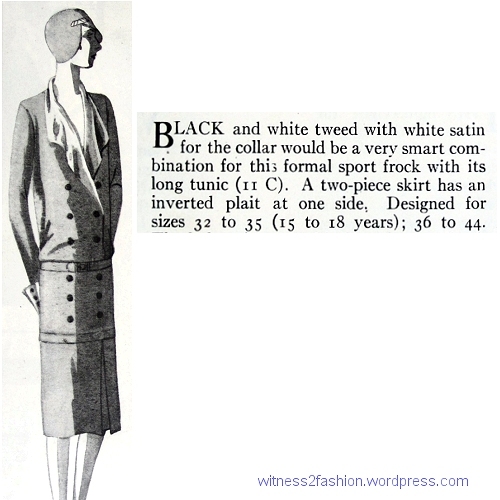 The page of color fashions (p. 52) had a half-page of black and white ones, along with all their descriptions, on page 53. Butterick patterns from page 53, July 1918. Nos. 9932, 1035, and 1037. The two on the right are heavily embroidered. This month in 1918 marked the start of a new Butterick pattern numbering sequence, from 9999 to the 1000s. I’m afraid the colors are overexposed in my photos, but still worth looking at. For those who want details, I’ll show each outfit with its original pattern description at the bottom of this post. Butterick 9989 and 9990, July 1918. Delineator. The dress on the left has a “Peter Pan” collar — very different from the Peter Pan collar of the 50s. Butterick 9986 and 9973, July 1918. Delineator. There was nothing but fashion to prevent a shapely girl from wearing her belt (or her basque bodice) tighter…. 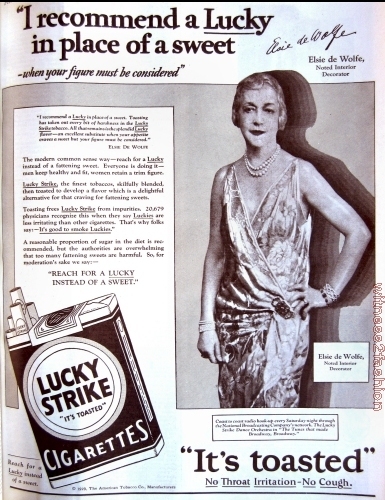 Butterick 1005, July 1918. Page 52. Delineator. That’s almost a 1920’s cloche hat. In case anyone is inspired to recreate these fashions, here are the original descriptions and alternate views. The high collared blouse fell out of fashion around 1912, when bare necks became acceptable, (cf Lucy Barton, Historic Costume for the Stage) but the V-neck in daytime was a new idea in 1914, so most of these patterns show a high-necked alternative for conservative women. Butterick 9947, July 1918. Delineator, p. 52. Transfer 10686 is the pattern for the bag, which seams to have a figure in a kimono on it. Bag, Butterick transfer pattern 10686 from 1918. Butterick 9989, July 1918. Delineator, p. 52. Left, Butterick 9986, July 1918. Delineator, p. 52. It has a side seam opening. Butterick 9973, July 1918. Delineator, p. 52. Butterick 1005, July 1918. Delineator, p. 52. “It slips on over the head,” like many of the 1920’s dresses that followed. Butterick 9932, July 1918. Delineator, p. 52. Without the optional shirring, it becomes an Empire line dress. For maternity wear, perhaps? Butterick 1035, July 1918. Delineator, p. 52. This style was available up to bust 46 inches, and the scarf-like “bretelles” end in pockets. Transfer 10674 is the embroidery design. 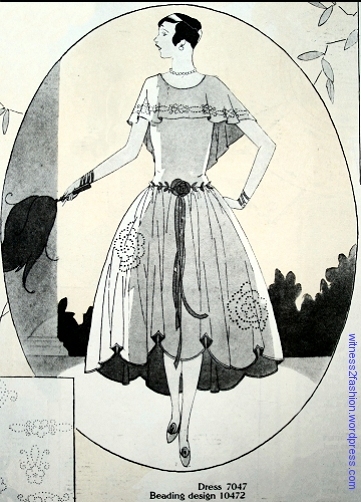 Butterick 1037, July 1918. Delineator, p. 52. The front panel could be asymmetrical. I’m surprised this dress is not shown without its tabard-like top layer. 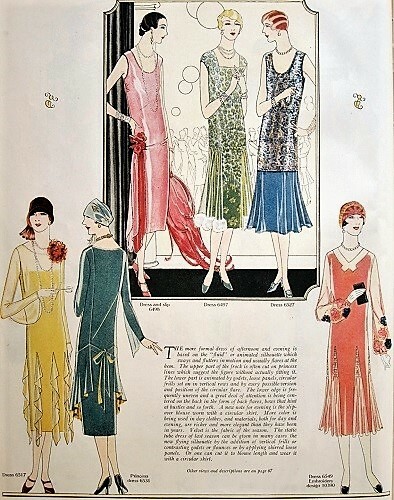 More dresses in color from 1918 to come…. This final (?) set of eight patterns, identifiable as “Forecast” patterns only because of their peculiar numbering, were illustrated by L. Frerrier, like previous Forecast patterns. Crowded on to one page this time, each pattern was shown in equal-sized front and back views. Nothing in the text explains why they cost a dollar each — twice as much as any other Butterick patterns. Forecast Wardrobe patterns 12 A through 12 H from Butterick, June 1928. Delineator, p. 42. L. Frerrier, illustrator. 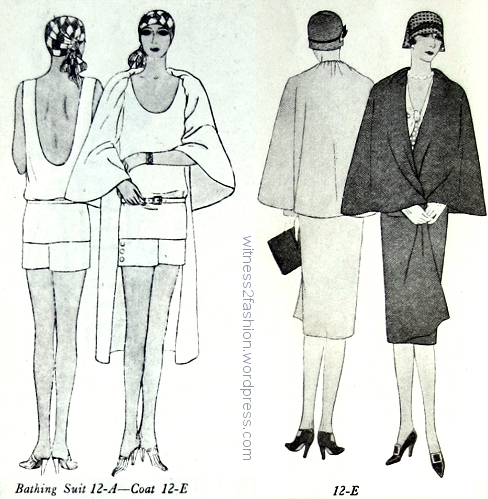 The bathing suit, 12 A, is shown with a variation of caped coat 12 E.
Forecast wardrobe patterns 12 A bathing suit and 12 E coat. Butterick, Delineator, June 1928. Butterick Forecast Wardrobe pattern 12 B, Delineator, June 1928. 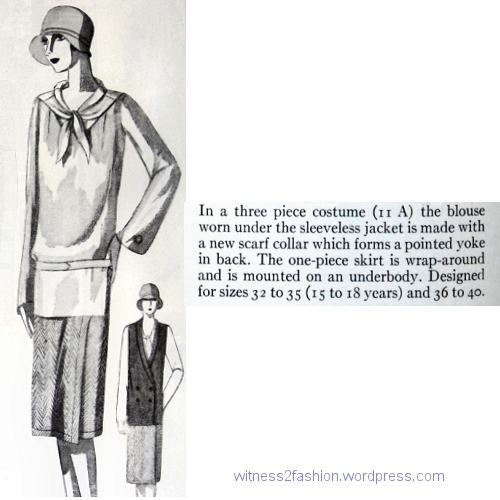 Butterick Forecast Wardrobe pattern 12 C, Delineator, June 1928. Butterick Forecast Wardrobe pattern 12 D, Delineator, June 1928. Butterick Forecast Wardrobe pattern 12 F, Delineator, June 1928. Butterick Forecast Wardrobe pattern 12 G, Delineator, June, 1928. The “new cord-narrow straps” on the slip (called spaghetti straps in the 1960s) — not to mention the depth of the V in back — would make it impossible to wear a 1920’s brassiere under this dress. Butterick Forecast Wardrobe pattern 12 H, Delineator, June 1928. None of these patterns was available in sizes bigger than a 40 inch bust measurement. Butterick issued eight more “Forecast” patterns, at $1.00 each, in March of 1928. Although the illustrations were large, the accompanying text was quite brief. 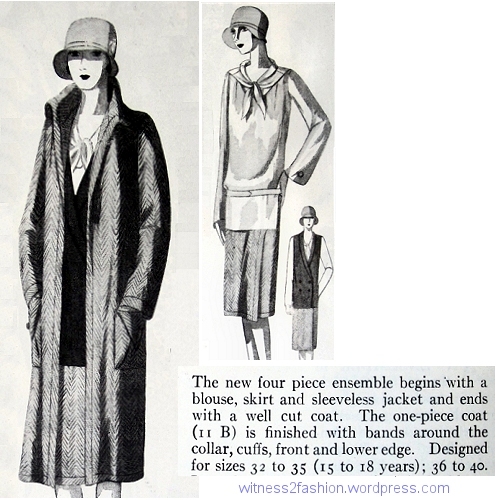 The two-page spread was titled “The Forecast Wardrobe Lays Complete Plans for Spring.” Butterick pattern numbers 11 A through 11 H cost $1.00 each, twice as much as normal, four-digit Butterick patterns cost in 1928. L. Frerrier did the illustrations again, but there was no lavish background scenery. In fact, I find this set of patterns rather unexciting. 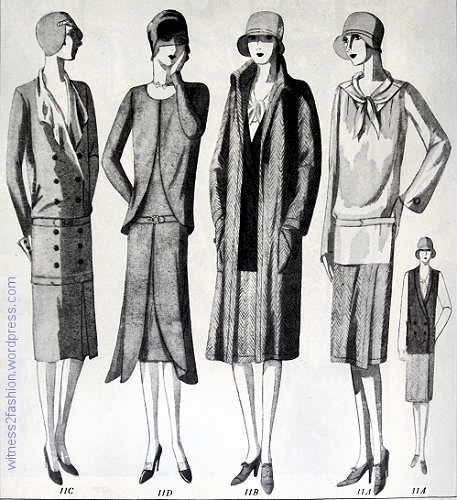 Daytime fashions: Butterick Forecast Wardrobe patterns 11C, 11D, 11B and 11A from Delineator, March 1928, p. 30. Evening fashions: Butterick Forecast Wardrobe patterns 11 F, 11 G, 11 H, and 11 E, from Delineator, March 1928, pg. 31. Illustrations by L. Frerrier. A “Wardrobe” pattern from the 1960’s or 1970’s usually included tops, skirts, trousers or shorts, and a jacket or coat, so that the buyer could plan a large, color-coordinated wardrobe. The daytime coat 11 B was intended to be worn with the blouse/skirt/vest pattern 11 A, but not necessarily with any other patterns in this series. Butterick Forecast Pattern 11 A. March 1928. The wrap skirt does not have a waistband; instead it hangs from the shoulders on a slip- or chemise- like “underbody.” The “scarf” is part of the back yoke and collar. Butterick Forecast Wardrobe pattern 11 B, March 1928. Perhaps because it’s intended for spring, the coat cannot be fastened. Butterick Forecast Wardrobe pattern 11 C, March 1928. 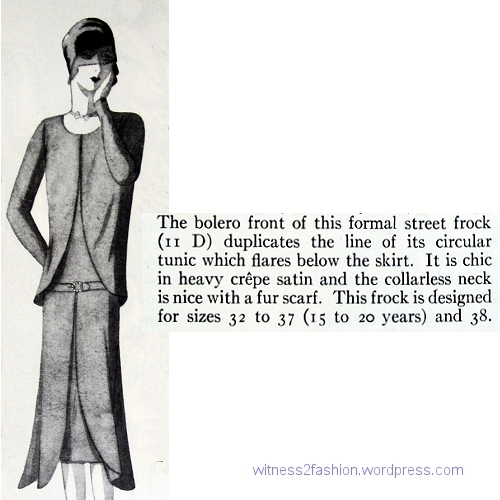 This “formal sport frock” is really a tunic and a separate skirt. Butterick Forecast Wardrobe pattern 11 D, March 1928. 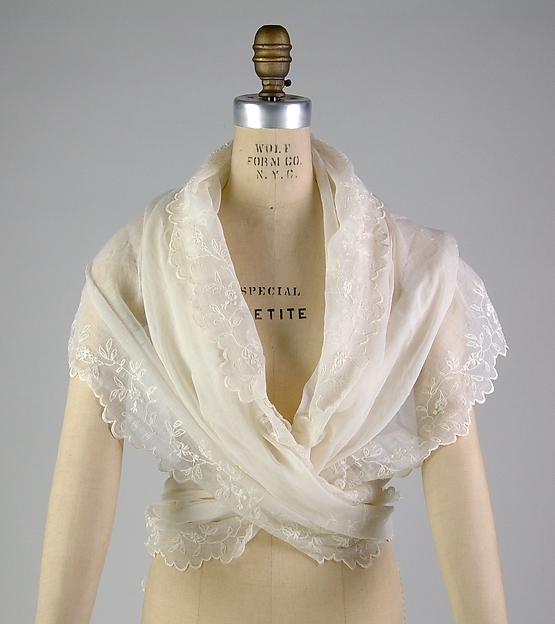 In the twenties, a “bolero” was often hip length, and, like this one, part of the dress, not a separate jacket. This would definitely look better with a fox fur “scarf,” since the neckline is very plain. Butterick Forecast Wardrobe pattern 11 E, March 1928. 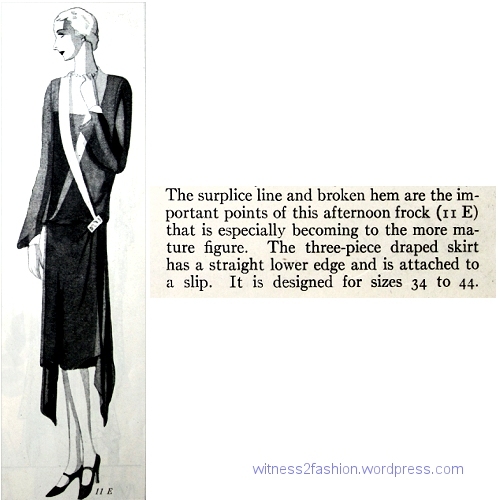 The diagonal “surplice” closing was often recommended as “slimming” to the woman who wore larger sizes. This pattern was available up to size 44 inch bust, with a 47.5 inch hip. Butterick Forecast Wardrobe pattern 11 F is a moire taffeta evening dress, March 1928. 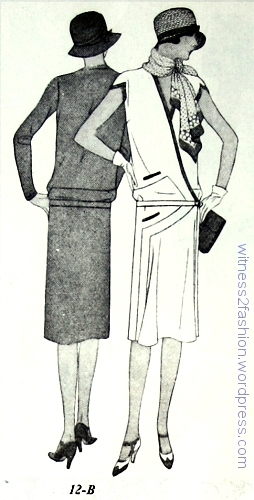 By 1928, snug hip bands like this, with a blouson effect above them, were quite chic. 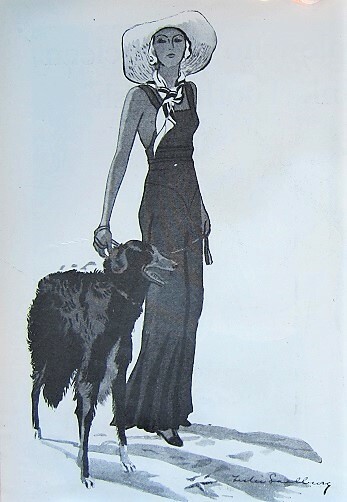 Butterick Forecast Wardrobe pattern 11 G, a lace evening gown, from March 1928. High-in-front-low-in-back hems hint that a change in length is coming. This dress would look very different with pleats (“plaits”) rather than ruffles. Note the tight hip. Butterick Forecast Wardrobe pattern 11 H, an evening coat with raglan sleeves. March 1928. You can see a line of gathers (shirring) on the sleeves. 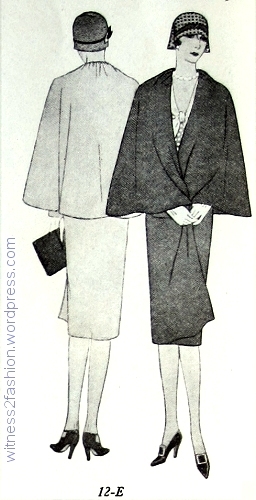 7/8 length coats were another sign that hem length was in transition in 1928. 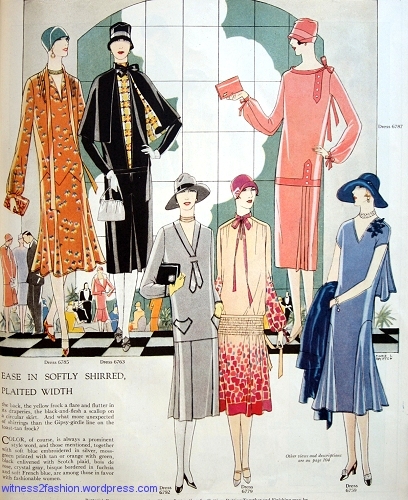 Butterick’s Delineator magazine featured an eight pattern “Forecast” wardrobe (at $1.00 per pattern) in January of 1928. 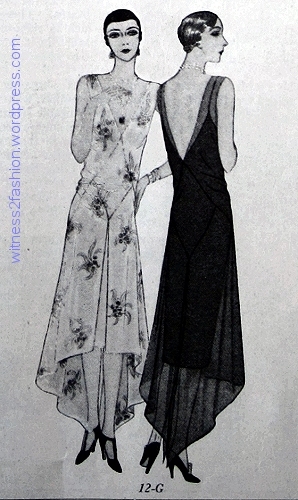 (However, unless you needed two evening dresses and two evening wraps, you would only need 6 patterns for the “wardrobe.”) The illustrations, by L. Frerrier, used the SS Ile de France for background. Although Frerrier illustrated all the sets of Forecast Wardrobe patterns for Delineator, this two page layout was the most elaborate. “Daytime Patterns of the Forecast Wardrobe,” Butterick 10B, 10F, 10A and 10 C, Delineator, Jan. 1928, page 30. Forecast Wardrobe pattern 10 B, Butterick, January 1928. “Incrustations” seems to mean applied trim. Forecast Wardrobe pattern 10 F, Butterick, 1928. Forecast Wardrobe pattern 10 A, Butterick, Jan. 1928. Forecast Wardrobe pattern 10 C, Butterick, Jan. 1928. The vestee can be seen in the opening between the lapels of the tunic. It is “on the bodice which holds the skirt.” The skirt is suspended from the shoulders, and does not have a waistband. 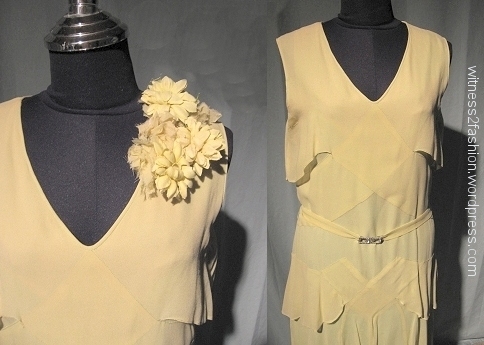 Again, a cluster of artificial flowers trims the shoulder. 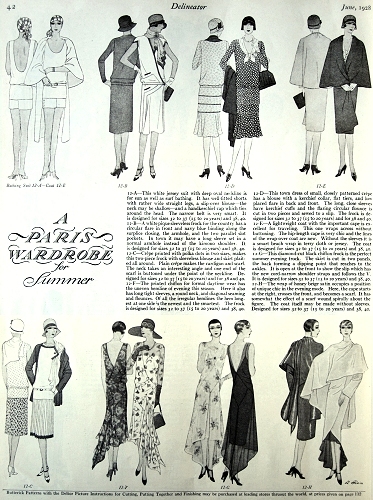 “Evening Patterns of the Forecast Wardrobe,” Butterick 10 D, 10H, 10E, and 10G; Delineator magazine, January 1928, page 31. Forecast Wardrobe pattern 10 D, Butterick, January 1928. Forecast Wardrobe pattern 10 E. Butterick, Jan. 1928. Forecast Wardrobe pattern 10 G, Butterick, Jan. 1928. Forecast Wardrobe pattern 10 H, Butterick, Jan 1928. 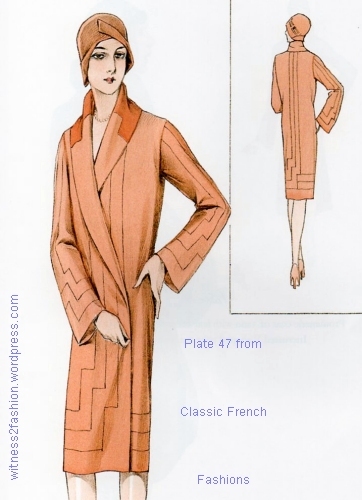 Usually, the uneven hemlines of the nineteen twenties were allowed to hang below the hem of the coat, but in this case, the dipping hem of the coat is designed to match and cover the “high in front, low in back” hem of the “robe de style” evening gown. 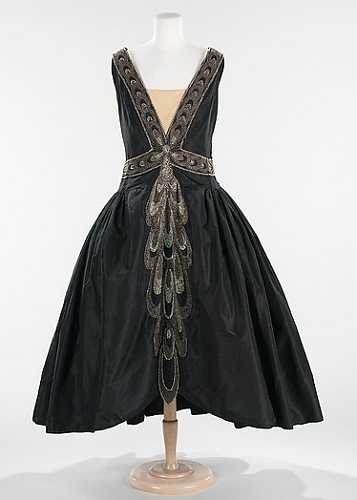 The “robe de style,” with its relatively snug bodice and full skirt, is usually associated with designer Jeanne Lanvin. 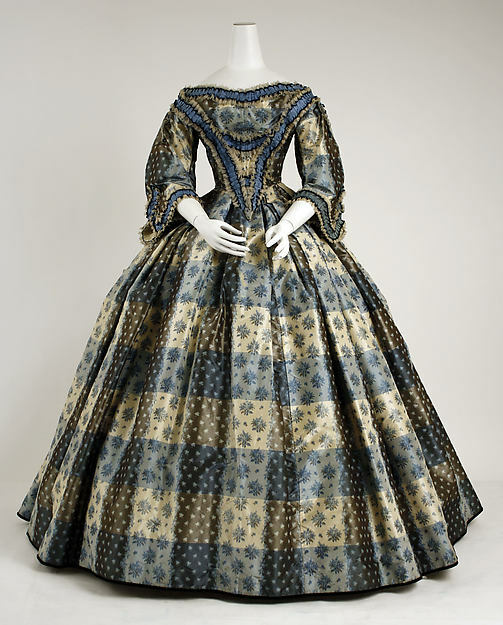 In lightweight taffeta it was often suggested for bridesmaids and young women, but in velvet or dramatic colors it was a “grand entrance” gown for sophisticated women.